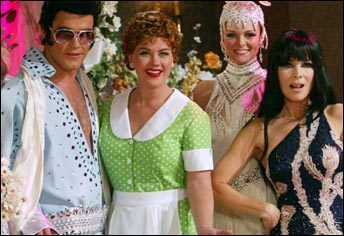 Costumes. . Wallpaper and background images in the Days of Our Lives club tagged: costumes alison sweeney sami belle martha madison lauren koslow kate cher lucille ball lucy. This Days of Our Lives photo might contain cocktail dress, sheath, bridesmaid, maid of honor, dress, and frock.